The Communist Party of Germany (German: Kommunistische Partei Deutschlands, KPD) was a major political party in Germany between 1918 and 1933, and a minor party in West Germany in the postwar period until it was banned in 1956. Founded in the aftermath of the First World War by socialists opposed to the war, led by Rosa Luxemburg, after her death the party became gradually ever more committed to Leninism and later Stalinism. During the Weimar Republic period, the KPD usually polled between 10 and 15 percent of the vote and was represented in the Reichstag and in state parliaments. The party directed most of its attacks on the Social Democratic Party of Germany, which it considered its main opponent. Banned in Weimar Republic one day after Adolf Hitler emerged triumphant in the German elections in 1933, the KPD maintained an underground organization but suffered heavy losses. The party was revived in divided postwar West and East Germany and won seats in the first Bundestag (West German Parliament) elections in 1949, but its support collapsed following the establishment of a communist state in the Soviet occupation zone of Germany. In East Germany, the party was merged, by Soviet decree, with the Social Democratic Party to form the Socialist Unity Party (SED) which ruled East Germany until 1989–1990. After the fall of the Berlin Wall, reformists took over the SED and renamed it the Party of Democratic Socialism; in 2007 the PDS subsequently merged with the SPD splinter faction WASG to form Die Linke. The KPD was banned in West Germany in 1956 by the Constitutional Court. Some of its former members founded an even smaller fringe party, the German Communist Party (DKP), in 1969, which remains legal, and multiple tiny splinter groups claiming to be the successor to the KPD have also subsequently been formed. Before the First World War the Social Democratic Party (SPD) was the largest party in Germany and the world's most successful socialist party. Although still officially claiming to be a Marxist party, by 1914 it had become in practice a reformist party. In 1914 the SPD members of the Reichstag voted in favour of the war. Left-wing members of the party, led by Karl Liebknecht and Rosa Luxemburg, strongly opposed the war, and the SPD soon suffered a split, with the leftists forming the Independent Social Democratic Party of Germany (USPD) and the more radical Spartacist League. In November 1918, revolution broke out across Germany. The leftists, led by Rosa Luxemburg and the Spartacist League, formed the KPD at a founding congress held in Berlin in 30 December 1918 – 1 January 1919 in the reception hall of the City Council Apart from the Spartacists, another dissent group of Socialists called the International Communists of Germany, also dissenting members of the Social Democratic party, but mainly located in Hamburg, Bremen and Northern Germany, joined the young party. The Revolutionary Shop Stewards, a network of dissenting socialist trade unionists centered in Berlin were also invited to the Congress, but eventually did not join the party because they deemed the founding congress leaning into a syndicalist direction. Under the leadership of Liebknecht and Luxemburg, the KPD was committed to a revolution in Germany, and during 1919 and 1920 attempts to seize control of the government continued. Germany's Social Democratic government, which had come to power after the fall of the Monarchy, was vehemently opposed to the KPD's idea of socialism. With the new regime terrified of a Bolshevik Revolution in Germany, Defense Minister Gustav Noske formed a series of anti-communist paramilitary groups, dubbed "Freikorps", out of demobilized World War I veterans. During the failed Spartacist uprising in Berlin of January 1919, Liebknecht and Luxemburg, who had not initiated the uprising but joined once it had begun, were captured by the Freikorps and murdered. The Party split a few months later into two factions, the KPD and the Communist Workers Party of Germany (KAPD). A new KPD leadership more favorable to the Soviet Union was elected in 1923. This leadership, headed by Ernst Thälmann, abandoned the goal of immediate revolution, and from 1924 onwards contested Reichstag elections, with some success. 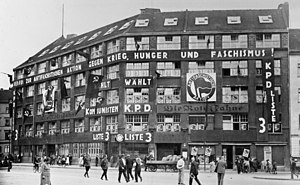 During the years of the Weimar Republic, the KPD was the largest communist party in Europe and was seen as the "leading party" of the communist movement outside the Soviet Union. It maintained a solid electoral performance, usually polling more than 10% of the vote and gaining 100 deputies in the November 1932 elections. In the presidential election of the same year, Thälmann took 13.2% of the vote, compared to Hitler's 30.1%. Critics of the KPD accused it of having pursued a sectarian policy, e.g. the Social Democratic Party criticized the KPD's thesis of "social fascism" (which addressed the SPD as the Communist's main enemy). This scuttled any possibility of a united front with the SPD against the rising power of the National Socialists. These allegations were repudiated by supporters of the KPD as it was said[by whom?] the right-wing leadership of the SPD rejected the proposals of the KPD to unite for the defeat of fascism. The SPD leaders were accused of having countered KPD efforts to form a united front of the working class. For instance, after Papen's government carried out a coup d'état in Prussia the KPD called for a general strike and turned to the SPD leadership for joint struggle, but the SPD leaders again refused to cooperate with the KPD. Repression beginning within hours after the fire, when police arrested dozens of Communists. Although Hitler could have formally banned the KPD, he did not do so right away. Not only was he reluctant to chance a violent uprising, but he believed the KPD could siphon off SPD votes and split the left. However, most judges held the KPD responsible for the fire, and took the line that KPD membership was in and of itself a treasonous act. At the March 1933 election, the KPD elected 81 deputies. However, it was an open secret that they would never be allowed to take office; they were all arrested in short order. For all intents and purposes, the KPD was banned as of 6 March, the day after the election. ^ Steffen Kailitz: Politischer Extremismus in der Bundesrepublik Deutschland: Eine Einführung. S. 68. ^ Beschluss vom 31. Mai 1946 der Alliierten Stadtkommandantur: In allen vier Sektoren der ehemaligen Reichshauptstadt werden die Sozialdemokratische Partei Deutschlands und die neugegründete Sozialistische Einheitspartei Deutschlands zugelassen. ^ Catherine Epstein. The last revolutionaries: German communists and their century. Harvard University Press, 2003. Pp. 39. ^ Gerhard Engel, The International Communists of Germany, 191z-1919, in: Ralf Hoffrogge / Norman LaPorte (eds. ): Weimar Communism as Mass Movement 1918–1933, London: Lawrence & Wishart, pp. 25-45. ^ Evans, Richard J. (2003). The Coming of the Third Reich. New York City: Penguin Press. ISBN 978-0141009759. Rudof Coper, Failure of a Revolution: Germany in 1918–1919. Cambridge, England: Cambridge University Press, 1955. Catherine Epstein, The Last Revolutionaries: German Communists and Their Century. Cambridge, Massachusetts: Harvard University Press, 2003. Ruth Fischer, Stalin and German Communism. Cambridge, Massachusetts: Harvard University Press, 1948. Ben Fowkes, Communism in Germany under the Weimar Republic; London: Palgrave McMillan 1984. John Riddell (ed. ), The German Revolution and the Debate on Soviet Power: Documents: 1918–1919: Preparing the Founding Congress. New York: Pathfinder Press, 1986. Bill Pelz, The Spartakusbund and the German working class movement, 1914–1919, Lewiston [N.Y.]: E. Mellen Press, 1988. Aleksandr Vatlin, "The Testing Ground of World Revolution: Germany in the 1920s," in Tim Rees and Andrew Thorpe (eds. ), International Communism and the Communist International, 1919–43. Manchester: Manchester University Press, 1998. Ralf Hoffrogge / Norman LaPorte (eds. ): Weimar Communism as Mass Movement 1918–1933, London: Lawrence & Wishart.